A variety of vegetarian food ingredients that are also vegan. Vegetarian cuisine is based on food that meets vegetarian standards by not including meat and animal tissue products (such as gelatin or animal-derived rennet). For lacto-ovo vegetarianism (the most common type of vegetarianism in the Western world), eggs and dairy products, such as milk and cheese, are permitted. For lacto vegetarianism, the earliest known type of vegetarianism (recorded in India), dairy products, such as milk and cheese, are permitted. The strictest forms of vegetarianism are veganism and fruitarianism, which exclude all animal products, including dairy, honey, and some refined sugars if filtered and whitened with bone char. There are also partial vegetarians who do not eat meat but may eat fish. Soy products, including tofu and tempeh, which are common protein sources. Eggs and dairy product analogues in vegan cuisine (such as aquafaba, plant cream or plant milk). Cereals/grains: barley, buckwheat, corn, fonio, hempseed, maize, millet, oats, quinoa, rice, rye, sorghum, triticale, wheat; derived products such as flour (dough, bread, baked goods, cornflakes, dumplings, granola, Muesli, pasta etc.). Vegetables (fresh, canned, frozen, pureed, dried or pickled); derived products such as vegetable sauces like chili sauce and vegetable oils. Fruit (fresh, canned, frozen, pureed, candied or dried); derived products such as jam and marmalade. Legumes: beans (including soybeans and soy products such as miso, soy milk, soy yogurt, tempeh, tofu and TVP), chickpeas, lentils, peas, peanuts; derived products such as peanut butter. Tree nuts and seeds; derived products such as nut butter. Herbs, spices and wild greens such as dandelion, sorrel or nettle. Other foods such as seaweed (however seaweed is considered inedible by some strict vegetarians for the same reason it can be considered to be non-kosher by orthodox Jews: the possibility of tiny animals sometimes adhering to it. ); derived products such as agar, which has the same function as animal bone derived gelatin. Beverages such as beer, coffee, hot chocolate, lemonade, tea or wine. Vegetarian food products made from cereal grains. Traditionally, Brahmin cuisines in most part of India, except West Bengal, are strictly vegetarian. Gujarati cuisine from the state of Gujarat in western India is predominantly vegetarian. Many bean, pasta, potato, rice, and bulgur/couscous dishes, stews, soups and stir-fries. Cereals and oatmeals, granola bars, etc. Numerous side dishes, such as mashed potatoes, scalloped potatoes, some bread stuffings, seasoned rice, and macaroni and cheese. 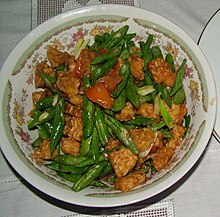 Buddha's delight, a famous Chinese vegetarian dish. Chinese (and other East Asian) dishes based on the main ingredients being mushroom, noodles, eggplant, string beans, broccoli, rice, tofu, most Tong Sui or mixed vegetables. Indian cuisine in Asia is replete with vegetarian dishes, many of which can be traced to religious traditions (such as Jain and Hindu). Gujarati cuisine of India is predominantly vegetarian among other Indian cuisines: Gujarati thali is very famous among Indians. There are many vegetarian Indian foods such as pakora, samosa, khichris, Pulao, raitas, rasam, bengain bharta, chana masala, some kormas, sambar, jalfrezis, saag aloo, subjis (vegetable dishes) such as bindi subji, gobi subji, Punjabi chole, aloo matar and much South Indian food such as dosas, idlis and vadas. Chapati and other wheat/maida based breads like naan, roti parathas are often stuffed with vegetarian items to make it a satisfying meal. Many Indian dishes also qualify as vegan, though many others use honey or dairy. South Indian foods like sambar, rasam, koottu, karembadu, upma, palya/taalimpu, kozhambu/koora, aviyal, olan, Kadala curry, Theeyal, Pulihora/puliyogare, Chammandi, Chutney, Chitrannams and breads like Appam, Puttu, pathiri, dosa, idli and vada. In Indonesia, vegetarianism is well served and represented, as there are plenty selection of vegetarian dishes and meat substitutes. Dishes such as gado-gado, karedok, ketoprak, pecel, urap, rujak and asinan are vegetarian. However, for dishes that use peanut sauce, such as gado-gado, karedok or ketoprak, might contains small amount of shrimp paste for flavor. Served solely, gudeg can be considered a vegetarian food, since it consists of unripe jackfruit and coconut milk. Fermented soy products, such as tempeh, tofu and oncom are prevalent as meat substitutes, as the source of protein. Most of Indonesians do not practice strict vegetarianism and only consume vegetables or vegetarian dishes for their taste, preference, economic and health reasons. Nevertheless, there are small numbers of Indonesian Buddhists who practice vegetarianism for religious reason. Japanese foods such as castella, dorayaki, edamame, name kojiru, mochi, taiyaki, tempura, vegetable sushi and wagashi. Miso soup is made from fermented white or red soy bean paste, garnished with scallions or seaweed. Although most traditional versions are made from fish stock (dashi), it can be made with vegetable stock as well. Korean cuisine has some dishes that are often vegetarian. One example is bibimbap, which is rice with mixed vegetables. Sometimes this dish contains beef or other non-vegetarian ingredients. Another Korean food which is sometimes vegetarian is jeon, in which ingredients (most commonly vegetables and/or seafood) are coated in a flour and egg batter and then pan-fried in oil. Cuisine of the Mediterranean such as tumbet and many polentas and tapas dishes. Mexican foods such as salsa and guacamole with chips, rice and bean burritos (without lard in the refried beans or chicken fat in the rice), huevos rancheros, veggie burrito, many quesadillas, bean tacos, some chilaquiles and bean-pies, chili sin carne, black beans with rice, some chiles rellenos, cheese enchiladas and vegetable fajitas. Italian foods such as most pastas, many pizzas, bruschetta, caponata, crostini, eggplant parmigiana, Polenta and many risottos. Continental cuisine such as braised leeks with olives and parsley, ratatouille, many quiches, sauteed Brussels sprouts with mushrooms, sauteed Swiss chard, squash and vegetable-stuffed mushrooms. In Germany, Frankfurt green sauce, Klöße with vegetarian sauces (e.g., Chanterelle), cheese or vegetable stuffed Maultaschen, combinations of quark, spinach, potatoes and herbs provide some traditional vegetarian summer dishes. Traditionally on Fridays, southern Germany broad variety of sweet dishes may be served as a main course, such as Germknödel and Dampfnudel. Potato soup and plum cake are traditional Friday dishes in the Palatinate. Brenntar in Swabia, it is made of roasted flour, usually spelt flour or oat flour. Many Greek and Balkan dishes, such as briam, dolmas (when made without minced meat), fasolada, gemista, vegetable based moussaka and spanakopita. Many Ethiopian dishes such as injeera or Ethiopian vegetable sauces or chillies. Mideastern food such as falafel, hummus (mashed chick peas), tahini (ground sesame seeds), minted-yogurts, and couscous. Many dishes in Thai cuisine can be made vegetarian if the main protein element is substituted by a vegetarian alternative such as tofu. This includes dishes such as phat khi mao and, if a vegetarian shrimp paste and fish sauce substitute is used, many Thai curries. Venues serving vegetarian Buddhist cuisine (ahan che; Thai: อาหารเจ) can be found all over Thailand. Most desserts, including pies, cobblers, cakes, brownies, cookies, truffles, Rice Krispie treats (from gelatin-free marshmallows or marshmallow fluff), peanut butter treats, pudding, rice pudding, ice cream, crème brulée, etc., are free of meat and fish and are suitable for ovo-lacto vegetarians. Eastern confectionery and desserts, such as halva and Turkish delight, are mostly vegan, while others such as baklava (which often contains butter) are lacto vegetarian. Indian desserts and sweets are mostly vegetarian like peda, barfi, gulab jamun, shrikhand, basundi, kaju katri, rasgulla, cham cham, rajbhog, etc. Indian sweets are mostly made from milk products and are thus lacto vegetarian; dry fruit-based sweets are vegan. These are vegetarian versions of popular dishes that non-vegetarians enjoy and are frequently consumed as fast food, comfort food, transition food for new vegetarians, or a way to show non-vegetarians that they can be vegetarians while still enjoying their favorite foods. Many vegetarians just enjoy these dishes as part of a varied diet. Tomato omelette where tomatoes and a paste of flour are used to produce a vegetable omelette without the use of eggs. Scrambled eggs where tofu is mashed and fried with spices (often including turmeric, for its strong yellow color) to produce a dish that strongly resembles eggs. Mycoprotein is another common base for mock-meats, and vegetarian flavorings are added to these bases, such as sea vegetables for a seafood taste. Labeling used in India to distinguish vegetarian products (left) from non-vegetarian products (right). Commercial products, marketed especially towards vegetarians and labeled as such, are available in most countries worldwide, in varying amounts and quality. As example, in Australia, various vegetarian products are available in most of supermarket chains and a vegetarian shopping guide is provided by Vegetarian/Vegan Society of Queensland. However, the biggest market for commercially vegetarian-labeled foods is India, with official governmental laws regulating the "vegetarian" and "non vegetarian" labels. ^ Edible fungi include some mushrooms and cultured microfungi (yeasts and moulds) such as Aspergillus oryzae and Fusarium venenatum, though some strict[clarification needed] Indian vegetarians do not eat mushrooms. ^ Rosell, Magdalena S.; Appleby, Paul N.; Key, Timothy J. (February 2006). "Health effects of vegetarian and vegan diets". Proceedings of the Nutrition Society. 65 (1): 35–41. doi:10.1079/PNS2005481. ISSN 1475-2719. ^ "International Vegetarian Union - The Origins of Some Words". ^ a b Harvard Health Publishing (4 December 2017). "Becoming a vegetarian". Harvard Health Publishing. Retrieved 8 October 2018. ^ Vegetarian/Vegan Society of Queensland. "Vegetarian/Vegan Supermarket Shopping Guide". Archived from the original on 20 May 2009. Retrieved 7 May 2009. Wikimedia Commons has media related to Vegetarian food. Look up vegetarian in Wiktionary, the free dictionary.